Despite the fact that 27 million people in the US wear hearing aids, and 65% of those are under the age of 65, there is still the stigma that people who wear a hearing aid are “old.” The stubbornness of this stereotype means that people with hearing loss want hearing aids that are discreet, if not invisible. That’s where In-The-Ear (ITE) hearing aids come into play. 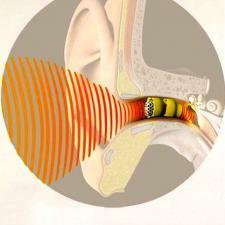 There are three basic types of hearing aids, Behind-The-Ear (BTE), In-The-Ear (ITE), and Receiver-In-The-Ear (RITE). Of these three styles, the In-The-Ear (ITE) is the most discreet and includes In-The-Canal and Completely-In-The-Canal hearing aids. The In-The-Canal style usually has a slightly visible receiver, but even this is hard to spot unless you are looking closely. Below, we've reviewed three models of hearing aids to give you an idea of the technologies available within the ITE style. Widex's The Mind™: Designed for mild to moderately severe hearing loss this hearing aid is recommended for adults as well as children and available as an In-The-Ear canal (nearly invisible). Features include the Zen relaxation and tone program, that helps the wearer manage tinnitus symptoms. SmartSpeak verbal messaging system that alerts the user when they need to do something like change the battery. It comes in three models 440/330/220. The lesser numbered model is the least expensive. All of these instruments provide an organic listening experience and digital technology, but the 440 has the most features. Phonak's Lyric (Extended Wear): Designed for mild to moderately-severe hearing loss, Lyric is a Completely-In-The-Canal hearing aid or what Phonak calls Invisible-In-The-Ear, meaning it's completely invisible. This hearing aid delivers high sound quality and can be worn 24 hours a day for up to four months. It is a true marvel of hearing technology in that authentic sound is captured by using the natural shape of the ear and also because the hearing aid is so close to the eardrum. The soft exterior provides comfort and because it’s disposable, it never requires charging. This hearing aid is a lot like contacts. You wear it for four months than throw it out. A year’s worth of Lyric is purchased in advance, so when you’re done with one pair, you simply return to your audiologist and have him insert the next one. Oticon's Intigai: Designed for mild to moderate hearing loss, this hearing aid is an In-The-Ear canal, taking advantage of the pinna and canal to reduce wind noise. Features include a Speech Guard that keeps speech audible even in challenging environments like a restaurant. Optimized Rise2 which gets the lowest power consumption ever in high performing instrument--meaning longer battery life. Automatic Adaptation Manager which automatically and gradually increases flexibility during the fitting process, so you don't have to go back for as many tuning sessions. Improved hearing may ward of dementia and Alzheimer's, means better relationships, more income, and has been shown to relieve depression and feelings of isolation, but a huge number of people still neglect their ears because they don’t like facing a condition that seems to indicate they are old. People with hearing loss are now being offered the technology and discretion they want, and most importantly today's advanced features can be customized to cater to the preferences of every individual. To learn more about which hearing aids might be suited to you and your hearing loss needs, visit your hearing health provider. If you need help finding a hearing health provider click HERE to be connected with the largest network of trusted hearing health professionals in the nation! What Caused Your Hearing Loss? Click on a word to find out more information on hearing health.